PURPLE RAIN, at the time of its release, was Prince’s THE SONG REMAINS THE SAME, cementing him as one of THE great musical artists of the Twentieth Century. Like Zappa. Like Rundgren. Unfortunately – unlike the magnificent songs that stand to this day – the actual film story has dated to the level of BREAKDANCE 2: ELECTRIC BOOGALOO. If only Prince could have couched his groundbreaking songs in something more durable. PURPLE RAIN has become a bemusing dichotomy – a dull, clichéd, formulaic storyline sprinkled liberally with the most innovative pop songs of its time. Set in a Minneapolis thrumming with the vibrant dance club scene that would define its niche in the mid-1980s, PURPLE RAIN is the story of The Kid (Prince) trying to “make it” in a scene where his original music is ridiculed. Brawling parents at home don’t help his brooding demeanor. All he has is his music and soon, a chick, Apollonia (Apollonia Kotero), whom band leader and competitor Morris Day (of The Time) keeps sniffing around like a dapper dog in heat. Ironically, the real life Prince was hugely, if not solely, responsible for Minneapolis becoming the colorful groove capital it would become. Of course, with his big bike and even bigger hair, The Kid beats all the odds with his stunning musical prowess and is accepted unto the dance scene’s corseted bosom. No real stylistic change from his opening to his final tracks, so we can only assume that the crowds either lost all discernment or suddenly found discernment.The only people who exhibit any acting backbone are Clarence Thomas III (as The Kid’s father), Morris Day and, surprisingly, Prince himself. Everyone else slots neatly into that formulaic storyline like the formulaic pieces they are. Over the course of the movie, we hear the entire Purple Rain album (you know you have it back there in the cobwebs on vinyl!) as either soundtrack or staged performance. The frenetic Let’s Get Crazy is the opener; The Beautiful Ones shows off Prince’s screaming timbre; Computer Blue features some great melodic guitarwork; When Doves Cry was the big single; and the diabolical Darling Nikki was the self-pleasuring, sado-masochistic clincher that spawned the PMRC (Parents Music Resource Center – those censoring, anti-Constitutional harpy senators’ wives led by Tipper Gore, Al’s wife). The title track is a surprisingly emotional finale. Prince sells the movie. His aura is unassailable. Purple Rain‘s liner notes declare, “Produced, Arranged, Composed & Performed by Prince & The Revolution.” It is all him; everything is on the line. 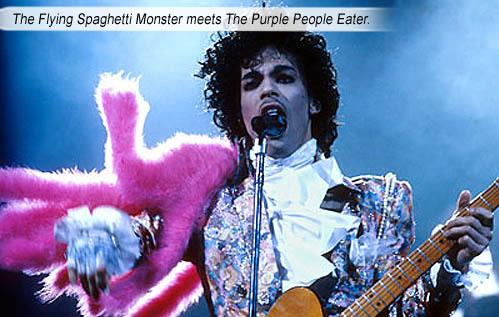 If this movie failed, Prince would have gone down with the purple ship. In 1984, me and my art college buddy/drummer-in-my-band cut classes to go see this movie. We learned more art in that electric purpleland than any that could be taught by old men who’d forgotten how to be renegades back when Hendrix was flying his purple boa. Writer: Albert Magnoli, William Blinn. Starring: Prince, Morris Day, Clarence Thomas III, Apollonia Kotero, Dez Dickerson, Olga Karlatos, Jerome Benton, Wendy Melvoin, Lisa Coleman, Bobby ‘Z’ Rivkin, Matt Fink, Brown Mark.